There is just something about the tone of Bach trombones that I love. Perhaps it’s in their overtones…I really don’t know for sure what it is. Even though I love the sound, I was never as fond of their response and flexibility until I tried the LT (lightweight) nickel slides. For me, adding an LT slide produces the ideal combination of tone, response, flexibility, and intonation in a Bach trombone. The fact that the entire line was designed by one person brings a consistency in both feel and slide positions through the different models that is very useful when you often switch between many sizes of trombones for various musical situations. Although there are more superb brands of trombone available today than ever, Bach still remains the standard to which they are all compared. Also known as the Bach 42b or 42bo, the Bach 42 model is a wonderful symphonic trombone. A bit heavier than a Conn 88H or King 4B but not as heavy as theYamaha Xeno, it has a fine projection and presence that holds up well to great dynamic contrast. I like both the yellow and gold brass bells; it just depends on which way I want the tone to lean – brighter or darker. The hand slide is wider than those on most other large bore trombones and rather heavy. That is another reason why I use the LT slide. They do offer a narrower slide, but I’ve never come across one. I have tried most all of the trigger valves available and still prefer the standard rotor, though I do like the open wrap over the traditional closed wrap. I put a short piece of plastic hose on the thumb paddle to make the reach easier and to give me a better grip that doesn’t feel slippery to my thumb. Moving the slide bumper to the lower slide tube (opposite the upper mouthpiece slide tube) is something I do now on all of my trombones. That way the slide return never bumps into your mouthpiece and face (Thank you, Urbie Green!). The Bach 42 doesn’t slot as decidedly as a Shires or Yamaha Xeno, which I prefer. I like an instrument that allows me more responsibility to place the notes where I want them to be. When trying out trombones, I always strike the edge of the bell with my thumb to make it ring (like a bell). An even, sustained ring will be a better and more responsive horn than one with an uneven, wobbly ring. When comparing different trombones, one with a higher sounding ring will play brighter than one with a lower sounding ring, which will play darker. This works on two piece bells as well as one piece bells, like on the Bach. 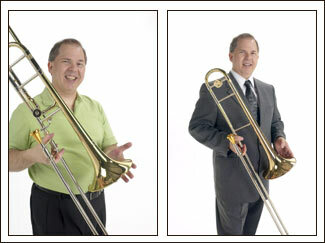 All in all the Bach 42 is a fantastic trombone for any type of playing where a large bore trombone is desired. This instrument review was with a Monette TT 4 LT mouthpiece. What is an F attachment or "trigger" on a trombone? The F attachment or "trigger" is a rotary valve added to the trombone, mostly found on larger bore models. This valve is operated with the thumb, and works like the fourth valve on a euphonium or tuba. When added to the slide, it drops the pitch to a lower harmonic series. For example, play a first position middle F, add the trigger, and you can now play a C below the F in first position. 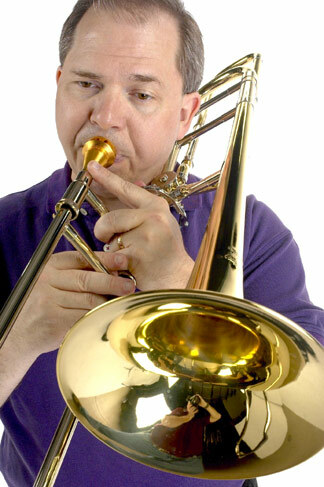 This increases the low range of the trombone and also offers additional alternate positions. There are many types of valve available for the F attachment, many with the goal of more closely matching the feel and sound of the "straight" trombone (one without a trigger). The rotary valve is the most common, with the Thayer, Hagmann, Greenhoe, Christian Lindberg, and Bach K valve available as well. The "open wrap" style of tubing is also a popular option, although some players still prefer the traditional (closed) wrap. The open wrap has fewer bends in the tubing, "opening" up the feel and sound of the trigger. 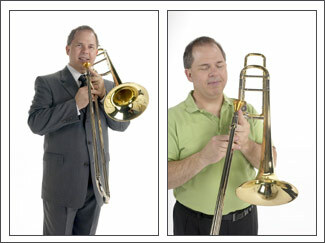 Most major trombone brands offer both styles of wrap, and some offer a choice of valves. "Stradivarius" - .547" bore, 8-1/2" one piece yellow brass hand-hammered bell, lightweight nickel silver outer handslide tubes, chrome plated nickel silver inner handslide tubes, clear lacquer finish. Comes with genuine Vincent Bach large shank mouthpiece and zippered cordura hard shell case. "Stradivarius" - Bb/F, .547" bore, 8-1/2" one piece yellow brass hand-hammered bell, lightweight nickel silver outer handslide tubes, chrome plated nickel silver inner handslide tubes, clear lacquer finish. Comes with genuine Vincent Bach large shank mouthpiece and zippered cordura hard shell case.